Our Integrated Pre-Kindergarten Program services preschool children between the ages of 3-5 which includes preschool students with a disability and students without disabilities. Services provided are based upon the individual needs of the preschool child found to have a disability, as determined by the Committee on Preschool Special Education of the local school district. Special education services are at no direct cost to the parent; funding is provided through county taxes and state funds. 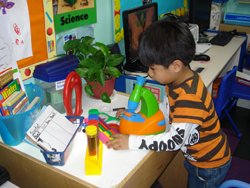 Sesame also provides an educationally oriented program of learning through play. We utilize the Creative Curriculum for Preschool, which is a researched based early childhood curriculum that is aligned with all applicable standards based expectations. Sesame employs the theme-based instructional interventions to make our classrooms and their activities more interesting to students and to assist them in the important ability to begin making connections from their active, explorative play and interactions independently with peers, materials and with their interactions with caring adults. We use developmentally appropriate activities to stimulate creativity and a life long love of learning.